Most provider stakeholders oppose the CMS banning accreditors like the Joint Commission from providing consultancy services, arguing the firewalls currently in place to prevent conflict of interest work. The CMS in late December issued a request for information asking for feedback from the public and stakeholders if they perceive a conflict of interest when accrediting organizations sell consulting services to providers they also accredit. The CMS received 127 comments, many of which are from those who work in healthcare. Agency officials didn't immediately respond to a request regarding what they plan to do now that the comment period has closed. The CMS has faced pressure to address the concerns that accrediting agencies engage in conflicts of interest after an investigation from the Wall Street Journal found that the Joint Commission, which accredits nearly 80% of U.S. hospitals, rarely pulls accreditation for providers even when violations of Medicare requirements are found. The paper found that just 1% of facilities not in compliance in 2014 lost accreditation. In addition to seeking public feedback on the issue, the CMS asked the Joint Commission and other accreditors to disclose how they establish relationships with providers they both sell consulting services to and accredit for participation in Medicare. The Joint Commission, in a 14-page comment letter filed in January, outlined the structures it has in place to ensure the information gathered from its consultancy, called Joint Commission Resources, isn't shared with its accrediting division. The two entities operate separately. The Joint Commission also has in place a "firewall" policy which prohibits Joint Commission surveyors from conducting any kind of consulting. The policy also prohibits Joint Commission Resources consultants from being in contact with an organization at any time during their on-site survey; helping accredited organizations with documents or reports related to compliance or helping the organization challenge decisions or findings made by the accreditors. "The Joint Commission enterprise believes that ensuring the integrity of the accreditation process is of the utmost importance. An essential component of that integrity is that accreditation must be free of the appearance or reality of any potential conflict of interest," the commission said in the letter. Richard Curtis, CEO of the Center for Improvement in Healthcare Quality, another private accreditor, expressed concern that prohibiting accreditors from consulting would only harm hospitals. 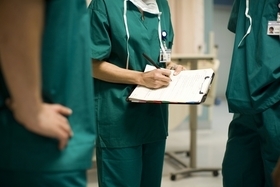 "Many smaller hospitals lack the resources to develop support services to the degree that can be offered by their accreditor," he wrote in a comment letter. He also said establishing too many stipulations around what consulting services can be offered "would rob providers of vital sources of assistance that do not pose a conflict of interest." The vast majority of commentators lamented the possibility that the CMS would disallow accreditors from doing consulting. Many said CMS' current requirements are "sufficient." The CMS requires accreditors to disclose their policies and procedures to avoid conflicts of interest. In one comment letter, Allyson Hammer, manager of organization integrity and regulatory affairs at Allina Health, wrote, "We believe in the firewall protections and have confidence that inappropriate influence between the consultative services and accrediting organization is not occurring," she said. Alyssa Keefe, vice president of federal regulatory affairs at the California Hospital Association, which represents more than 400 hospitals and health systems, wrote that members find fee-based consultative services provided by accrediting organizations "extremely useful." Although Keefe said the California Hospital Association opposes the banning of accreditors from offering consulting services, the "agency could take steps to improve the transparency of these relationships and implement a process for initiating conflict of interest complaints." A rural hospital also offered insights. John Yeary, CEO of Freestone Medical Center in Fairfield, Texas, said his facility has limited resources, so he depends on accrediting organizations to successfully achieve accreditation. "We do not have unlimited staff resources to throw at a problem or program. ... To have an accrediting organization appropriately interpret COPs and assist with ideas on how to address COP issues is a huge value," he wrote. But some stakeholders want the CMS to take more definitive action. National Nurses United, which represents more than 155,000 registered nurses, called on the CMS to prohibit accreditors from having any financial relationships with organizations they accredit. "Only by ending financial ties between Medicare providers and AOs—including a complete bar on AOs providing consultative services to providers seeking Medicare accreditation and even a bar on hospitals directly paying for Medicare audits—can the integrity of the Medicare hospital accreditation process be upheld," Bonnie Castillo, the union's executive director, wrote in a comment letter. Angela Mead, who said that she's been in healthcare for "many years," wrote that she's "always been astounded that CMS has not previously questioned conflicts of interest with accrediting bodies such as the Joint Commission. ... I have always felt there is a huge compliance risk with Joint Commissions being the accreditor as well as the vendor. It's like the fox watching the hen house."